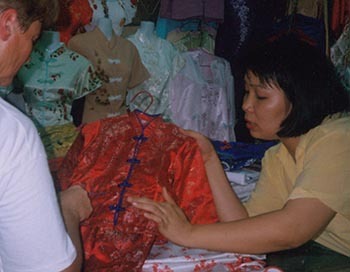 Have fun shopping for toys, wooden and metal crafts, embroidery and much more in Ho Chi Minh City, Vietnam. The streets are just lined with shops, so it's not hard to find things to buy, but it can get overwhelming with so many choices. Also there are some specialty items that may be difficult to find unless you know where to go or what to ask for. The hotel staff are a good resource if you want to find something in particular. I also found that impulse buying was a good thing in Vietnam. If I saw something I liked, I went ahead and bought it then. Normally I like to think on things a bit, but the trip is so quick and can get filled up with adoption work or trips to the medical clinic, etc that it can be difficult to make it back for something. So, I just bought it if I liked it. The prices for things are soooo good it's not hard get a lot for your buck (or dong!). We've been to Vietnam 3 times for 3 adoptions, so we have quite a collection of wonderful handicrafts and other things from Vietnam. We bought gifts for each of our kids to give to them every year on their "gotcha day" as well as lots of other things to decorate our house and give away to family and friends. Between the three trips we did most of our shopping at the Tax market (across from the Rex), Ben Thanh market, and Don Khoi Street (can be more expensive but nice selections). We also made it to several other markets. I bought a gold chain on each adoption trip. These are one of my favorite buys. I'll hand them down to each child when they're older). *hand carved from stone "chops" with each child's name and birth animal (eg. *extra suitcases to bring all this stuff back home! That's it! If you're a shopper, hope you got some good ideas for your own trip! Molly Butler and her husband have three children, all of whom were adopted from Vietnam.